Lead qualification is an effective method of improving the odds of closing a sale. Instead of wasting valuable time with a prospect that doesn’t see the benefit of our proposition, the sales person should move on to another more qualified lead. By using objective standards for qualifying a lead, the sales force can uniformly apply salability criteria to each lead. A written scorecard enables the sales force and management to come to an agreement on those factors that are most representative of a qualified lead. First page of a representative three page scorecard is shown below. • The standards or criteria are derived from the experiences and profiles of existing customers; the most relevant and correlated criteria associated with the existing customer’s behavior, position, need profile, business situation, industry, etc. are used in developing the scorecard. • The scorecard is organized into logical groupings (Strength of Conviction, Relationship, Operational Fit, and Competitive Positioning, for example). • Within each group, specific criteria (Buying Signals, Reasons to Act, Business Impact, Access to Decision Maker, Budget, Culture, etc.) are used and measured by assigning a value to each gradation of these criteria ( Impact on Business could have ranges from Major Financial Impact all the way down to No Significant Impact). • Analysis of existing and lost account data as well as sales rep’s knowledge of these situations are used to identify the most important criteria, rankings and values. In addition, weight may also be assigned to each group based on its importance. • The development of a comprehensive lead qualification scorecard enables the sales force and management to be on the same page as to when a prospect should be advanced as a qualified lead. • The process removes most of the ambiguity and contentiousness in the lead qualification process. 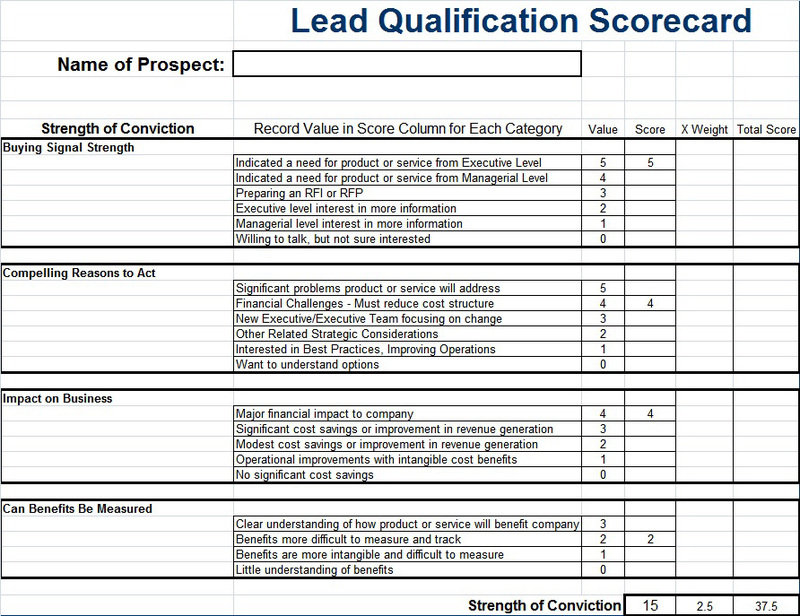 • Sales time spent with truly qualified leads yields to higher sales, more consistent results, and more productive reps.
Click on the link for the whitepaper entitled Better Prospecting with the Lead Qualification Scorecard found in the Resource Center.